March 1, 2016, 11:59 AM · In an effort to promote the coverage of live violin performance, Violinist.com each week presents links to reviews of notable concerts and recitals around the world. Baiba Skride performed Bartok's Violin Concerto No. 2 with the New York Philharmonic. The New York Times: "Ms. Skride brought a wide tonal palette to her insightful and passionate interpretation, her tone meaty and bold to open, then sweet, gossamer and brash. The lyrical lines unfolded with soaring energy, and she surmounted the technical challenges with aplomb." James Ehnes performed the Sibelius with the Philadelphia Orchestra. Palm Beach Daily News: "The Canadian violinist delivered an ideal interpretation: He drew endless colors from his “Marsick” Stradivarius, negotiated the many technical difficulties with ease and played the more introspective passages with sincere feeling." Janine Jansen performed Shostakovich's Second Violin Concerto with the London Symphony Orchestra. The Guardian: "Janine Jansen met its considerable challenges with formidable technique and expressive power without once becoming self-consciously showy." Benjamin Beilman performed the Beethoven with the Wichita Falls Symphony Orchestra. Times Record News: "Beilman's style is very pure, clean and clear, and he smoothly moved through the concerto's passages, showing his technical mastery as he pushed the instrument through its whispers and its most vigorously objections." Augustin Hadelich performed Bartok's Violin Concerto No. 2 with the BBC Philharmonic. Nottingham Post: "Hadelich's was an exceptional performance, not only showing complete mastery of the work's fiendish technical demands but also able to probe beneath the surface, changing mood rapidly from the passionate and brutal to the nostalgic and introspective. And, miraculously, all from memory." Kristóf Baráti performed the Khachaturian with the London Philharmonic Orchestra. The Argus: "Soloist Kristóf Baráti cut a serious figure throughout the imperious piece, his concentration admirably unswayed by a potentially ticklish experience - a broken bow-string dancing around his face by the end of the first movement." Simone Lamsma performed the Brahms with the Calgary Philharmonic Orchestra. Calgary Herald: "The performance was technically remarkably secure, and the sound varied and sonorous. But it was not fat Brahms. It was Brahms as singer, the spirit of music projected through a suggestive, pliant outpouring of song in a spirit informed by a more modern understanding of the idea of lyricism." Christian Tetzlaff performed works by Schumann and Dvorak in trio with cellist Tanja Tetzlaff and pianist Lars Vogt. The New York Times: "Mr. Tetzlaff’s wiry tone is not the most luxurious sounding, but it’s ferociously articulate and agile, as in his fluent transition in the Schumann’s second movement from elegiac to playful and back again. In the third movement he joined Ms. Tetzlaff’s coppery earthiness and Mr. Vogt’s velvety delicacy for an offhand opening that led to a gauzy, endearingly awkward dance." Gil Shaham performed the Leshnoff with The Knights in Atlanta. ArtsAtl.com: "Leshnoff’s concerto, beautifully rendered by Shaham and the orchestra, was a delightful discovery. It has only two movements: a slow, somewhat simple first movement that allows the sound of the solo violin to bloom above an unfolding orchestral texture, and a fast, rhythmic but fun second movement." Itamar Zorman performed in recital with pianist Kwan Yi at Wolf Trap, Washington, D.C. The Washington Post: "...the sounds he makes are angelic indeed; clean, perfectly in-tune, fluent and small-scaled." Violinist.com: (same program at Radford, Va.) "This was polished artistry." Lauren Roth performed Bruch's Violin Concerto No. 1 with the Tucson Symphony Orchestra. Green Valley News: "The solo artist was TSO Concertmaster Lauren Roth....she used the high, lyrical passages and the low, viola-like and almost cello-ish reverberations of the instrument with great artistry. Her sparkling arpeggios and chromatics were breathtaking, the athletic double stopping inspiring." Kirk Toth performed the Berg with the Toledo Symphony. The Blade: "Concertmaster Kirk Toth did full honors as the soloist in the Berg Violin Concerto....Toth grappled masterfully with the complex solo line. Double, triple, and quadruple stops, dual polyphonic lines, and a barrage of accidentals flitted in a stream of consciousness somewhere beyond the ken of human emotional comprehension. Augustin Hadelich performed the Tchaikovsky with the London Philharmonic Orchestra. The Guardian: " The finale dazzled with its speed and prowess. Elsewhere his determination to avoid sentimentality resulted in an occasional lack of poetry. His encore of the andante from Bach’s Second Violin Sonata was intimate, poised and beautifully done." 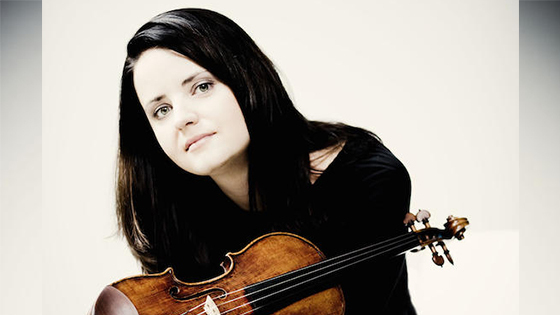 Baiba Skride performed the Brahms VC and Double Concerto with the Detroit Symphony Orchestra. Detroit Free Press: "Though I've liked violinist Baiba Skride in the past, her high-wire approach to the Violin Concerto struck me as a little mannered, But she and cellist Danjulo Ishizaka, whose sound was both poised and penetrating, paired well in the idiosyncratic Double Concerto." Gil Shaham performed Prokofiev 2 with The Knights in Blacksburg, Va.
Violinist.com: "There was confident joy and even some dazzle in Shaham’s playing, but I didn’t hear abandon or grit. I heard a clean and linear, silvery style that gave the entire work a neo-classical feel, which I believe Prokofiev himself would have appreciated." March 2, 2016 at 04:50 PM · Out of several reviews I found after seeing Hadelich's Tchaikovsky with LPO, I am surprised this is the one that got posted! I quite enjoyed the concert, myself, and disagree with critics with too many preconceived expectations, especially after reading his thoughts about the Tchaikovsky concerto on his website. March 2, 2016 at 07:16 PM · Thank you for adding those! We post the Week in Reviews every Tuesday, and though we try, we don't always find everything. But please, if anyone has a review they wish to see posted on Tuesday, please email me!